Maricopa County will likely settle three suits against Joe Arpaio and Andrew Thomas for about $2 million. This is on top of nearly $1.5 million in defense costs the County has already incurred in the cases. Apparently, they consider themselves lucky to be getting off that cheap. The good news: Andrew Thomas was disbarred, a fate he richly deserved for his amazing prosecutorial abuses, for example bringing fake RICO and bribery charges against a judge to force him to recuse himself from another case in which he was likely to rule against Thomas. Some of my many articles on Thomas are . But here is what depresses me: I believe he was disbarred only because his prosecutorial over-reach and abuse was aimed at public officials. Similar or worse abuses against private parties are seldom if ever punished. This is lawyers and public officials defending their own. When I see this much concern aimed at abuses of private individuals, I will be more likely to cheer. Update: I am a terrible editor, but I am sure I did not type "Proprietorial" rather than "Prosecutorial" in the original title. I think I have some kind of weird auto-correct problem going on. Though until now I did not know "proprietorial" was a word. The same people responsible for tens of millions in claims being filed against Maricopa County are now drooling after their own pot of gold. Former Maricopa County Attorney Andrew Thomas and David Hendershott, Sheriff Joe Arpaio's former right-hand man have filed a notice of claim along with Thomas' former lackey, Lisa Aubuchon, for a combined total of $60 million. Aubuchon had already filed a $10 million claim; she's revised that to $22.5 million. Andrew Thomas, who quit the job voters gave him and failed in his bid to become state Attorney General, has the gall to seek $23.5 million from taxpayers. And Hendershott, the infamous Chief Deputy now under investigation following a co-worker's allegations of corruption and abuse of power, wants $14 million. For the first time in my life, I voted in a partisan primary for the Coke/Pepsi parties this year specifically to vote against Thomas. I cannot even imagine why they think they deserve this kind of payoff. If anyone should be suing, it is the citizens of Maricopa County who should be suing these three. Lots of articles about him on my site, but this one in the ABA Journal covers a lot of the ground. PHOENIX -- The Arizona Supreme Court has appointed a special investigator to look into accusations of misconduct against Maricopa County Attorney Andrew Thomas. That's bad, but it's not the end of Thomas's troubles. The next shoe is the tort case. Malicious prosecution is a tort and if a civil litigant obtains a ruling that Thomas abused his office, it could cost the County tens of millions of dollars. Multiply that by the number of people whom Thomas has targeted, intimidated, abused or prosecuted and we are dealing with a very large number indeed. Radley Balko has a great article on Maricopa County Attorney Andrew Thomas, the wingman for Sheriff Joe Arpaio in any number of abuses of power. I have tried to write about Thomas before, but some of his exploits are so bizarre and complex that they make simple description difficult, but Balko is clearly a better journalist than I and does a good job summarizing some of his most egregious actions. The common denominator for both Thomas and Arpaio tends to be their near vendetta responses to anyone who either criticizes them or tries to limit their power (ie by denying a search warrant or dismissing one of their cases). The most recent mess in Maricopa pits Thomas and Apraio against...well, just about everyone else. The two have been squabbling with members of the county board of supervisors for years over the construction of a $341 million county courthouse tower, which both feel is a waste of money. They might have a point. But Arpaio and Thomas are using criminal law as a cudgel in the dispute. Last month, Thomas indicted two county supervisors on some petty financial disclosure violations. When Maricopa County Superior Court Judge Gary Donahoe issued a ruling pertaining to the court tower investigation that Arpaio and Thomas didn't like, Thomas then indicted Donahoe for bribery, on the absurd premise that as a judge who works in the courthouse, Donahoe (who is retiring soon) would have benefited from the new tower. That indictment came shortly after Donahoe held one of Arpaio's deputies in contempt after a highly-publicized incident in which the deputy was caught on video stealing documents from the file of a defense attorney in open court. Using criminal charges"âor the threat of them"âto silence political opponents has become something of a habit for Thomas. He has indicted more than a dozen public officials who have criticized him or Arpaio. He has launched or threatened criminal investigations into dozens of others, including politicians, columnists, and other media figures who have dared to criticize him or the sheriff. When Phoenix Mayor Phil Gordon asked for a federal investigation of Arpaio's immigration enforcement tactics, Arpaio and Thomas investigated him too, attempting to snoop on Gordon's email, appointment book, and phone records. Thomas even recently threatened to criminally investigate a defense attorney for issuing public statements in support of his client. Bolick says their perseverance is also due to the polarizing effects of the immigration debate. Immigration "is extremely divisive," he says. "In the eyes of a lot of people, because they're cracking down on illegal immigrants, Thomas and Arpaio can do no wrong. So there's justification for whatever they do, and any criticism of them on any issue is a betrayal of the cause. It's really unfortunate that it's causing a lot of good people to turn a blind eye to ineffective law enforcement and abuses of power." First, the Nazis went after the Jews, but I wasn't a Jew, so I didn't react. Then they went after the Catholics, but I wasn't a Catholic, so I didn't object. Then they went after the worker, but I wasn't a worker, so I didn't stand up. Then they went after the Protestant clergy and by then it was too late for anybody to stand up. These guys have totally lost it. OK, they have always been bonkers, but they have finally lost their ability to paper over their nutty paranoia and quest for power in the media. Remember I told you the other day that Arpiao and Thomas keep filing wider and wider criminal conspiracy charges against their critics. Basically anyone who criticizes them or seeks to keep their power limited within Constitutional boundaries is a criminal in their eyes. Maricopa County Attorney Andrew Thomas called for investigations into the chief prosecutors of two neighboring counties on Thursday because they publicly criticized him and Sheriff Joe Arpaio earlier this week. Yavapai County Attorney Sheila Polk and Pinal County Attorney James Walsh sent separate letters to the Arizona Republic, criticizing what they called "abuses of power" by Thomas and his close ally, Arpaio. Polk, a Republican who described herself as a passionate believer in limited government, accused the two men of "totalitarianism" and said they have become "a threat to the entire criminal-justice system" because of a series of a investigations they have launched against their foes. 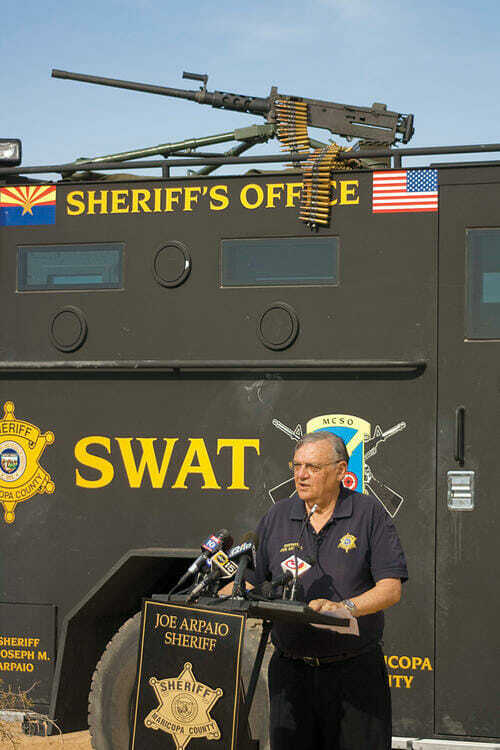 In recent weeks, Thomas and Arpaio have announced more than a dozen criminal investigations into public officials who have criticized them in the past. The pair has said their fellow Maricopa County officials are engaging in a massive conspiracy to obstruct justice and limit their power. The investigations have resulted in criminal charges against two elected officials and a judge. In his request for an investigation into the comments, Thomas alluded to a supposed campaign to enlist these attorneys "and possibly other third parties" to criticize him and the sheriff. Arpaio is the same paranoid who cost the County hundreds of thousands of dollars when he demanded extra security because he believed himself to be an assassination target. If it wasn't so overdone, I would do another Downfall mash-up on this for YouTube.